In Modern Wars, What Happens To Captured Weapons? For the U.S. Army, it depends on the type of weapons, and what our needs are. In Iraq, my unit regularly captured caches (sometimes very large ones). Typically these were your standard “slavshit” weapons — busted up AK-47s and AKMs, old RPKs, a few RPG-7 launchers and the like. We’d search through them, take anything that looked like it would be in good condition (usually AK-74s and some AKMs, when we could find ones in good condition), to be given to the Iraqi police or Iraqi Civil Defense Corps trainees as service weapons. The rest were blown up. In some cases, literally entire warehouses at once. 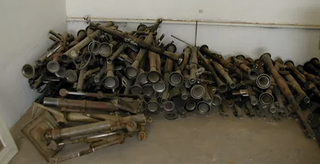 I’ve included some pictures of it, but as I noted in another question, we blew a cache once that probably contained thousands of weapons, in what was basically a rentable storage facility — 10x10 or 20x10 rooms stacked to the ceiling with AKs, 80mm mortars, RPGs, all kinds of stuff, even a few foreign arms (some old StG 44’s were in there, a few FAMAS, etc.) When EOD (Explosive Ordnance Disposal) blew the site, there was so much ordnance that the “minimum safe distance” for the detonation was 2 miles. For larger things, like ZPTUs, 57mm AA guns, T-55s, etc. we’d disable them in place. We’d melt/destroy the barrels, mark them for the engineers for further demolition, and then move on. The company brought back a few very rare items as a trophy (not individuals, I mean the entire unit as an entity). This included a gold plated suppressed MP5, an ivory and lapis lazuli AK, and a captured AA gun. They’re located now at our headquarters (the guns are framed, the AA sits outside as a museum piece). In modern wars, what happens to captured weapons? originally appeared on Quora.